This past Jan 1st, 2019 marked the 25th edition of the Lantern Ski at the Mt Macpherson ski trails! In honour, and in response to a number of questions we received, we decided to compile a short history of the event, according to past organizers. 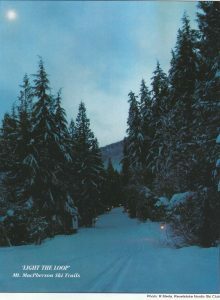 The first lantern ski was held on February 20, 1999. The club’s new Piston Bully (purchased in 1998) had a broken moog. 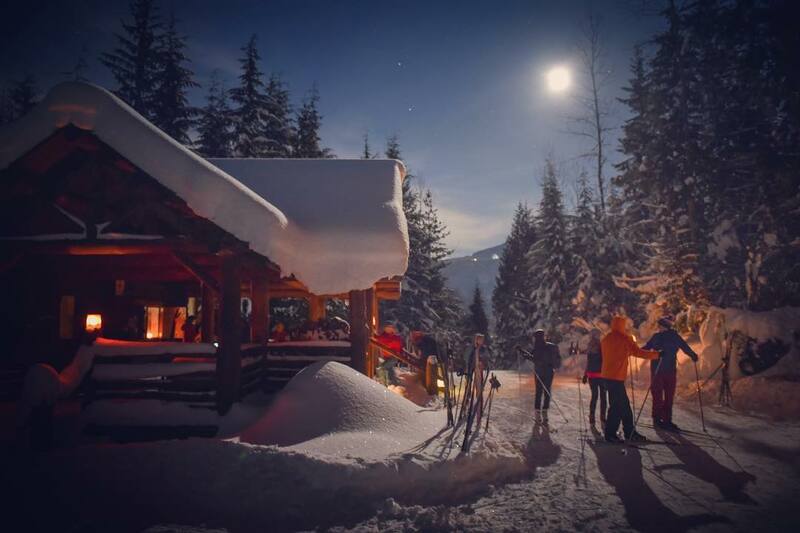 The club executive wanted to do something special for the membership to make up for the broken groomer, so they decided to host a lantern ski. Originally it was going to be a one-off event. However, everyone liked it so much that they decided to make it an annual event. Back then we didn’t have lanterns, so we rented them from Soverign Lakes. Brian Abear made two trips all the way to Vernon, to pick up all the lanterns and the posts, and presumably one or two trips back to return them after the event! One year later, we used Larch Hills’ lanterns. Robyn Abear made the trip this time. Larch Hills was kind to share them, but concerned about all of the transportation and possible damage to the lanterns. In mid-2000, Rubyanne Meda started an initiative called ‘Light the Loop’ which asked members to tack on $10 to their membership fees to purchase lanterns. Each lantern cost about $10 so you kind of owned a lantern. About $1500 was raised. Woo hoo! When the lanterns were purchased, the club needed a good way to store them. A work party was organized to construct boxes at Ken Gibson’s house. The lantern poles were also made at this time. Bev Clark was also involved from almost the start. She remembers Mickey Olsen driving the groomer up to Ole Sandberg cabin packed with supplies: Cookies from the Chalet Bakery, home-made mulled wine, left over Christmas goodies donated by members, a generator for Christmas lights, and a gas stove* as back up for the wood stove. One year, Rubyanne was riding in the groomer with Mickey Olsen on the way up to set up the cabin. They had the gas stove. It was an older stove that needed to be primed. They set the stove up in the cabin and pumped it. When Mickey struck the match, flames went right up to the ceiling! Rubyanne ran outside for a shovel full of snow to douse the flames! Luckily, nothing ignited, and they had Hot Chocolate ready for the first skiers! There may have been some singed eyebrows. Before the lodge was built in 2010, the only indoor area was Ole Sandberg. People would purchase their ticket at Bev’s Bungalow (challenge: do you know where Bev’s Bungalow is now? ), and then head up to a busy Ole Sandberg cabin. For many years the Lanterns were stored at the McInnes’ house. Every year we would gather a group there and eat snacks and drink tea and clean and fill the lanterns with Allan and Evelyn. One of these years was Kieran’s first year of helping out. He was almost 1. There were a couple of years when the lanterns were stored at the Forestry office. One year, Kathy Bellis and Brendan cleaned and filled them outside in cold weather by themselves! In 2010, the lodge was built and we had a new storage facility for them! Brian Abear groomed for the Nordic Club from 1977 to 2010! 120 lanterns were purchased in 2000. We still have over 115 functional lanterns! Brian Gawiuk has been donating all of the oranges, and creating all of the ice lanterns, as well as providing indispensable help to the lantern ski for a very long time. 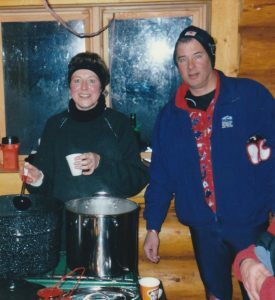 In 2004, in conjunction with the lantern ski, there was a small memorial service for Murray Mcquarrie. This was organized by Dianna Graham. The lantern ski was only ever cancelled once, maybe it was Jan 2006, when there was a torrential rain. One year, the lanterns were not set up. In 2011, instead of lanterns, we skied to the new lights on Mickey’s Loop. It was fun, but there was a big call to have the lanterns back. In 2012, we began using the lanterns and the lights. Not many people had headlamps in the early 2000’s, so there were a lot of crashes on the steep hill of Main Loop! There have been so many amazing volunteers that have helped out with the Lantern Ski over the past 25 editions. 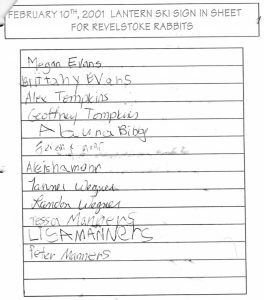 People coming out year after year to light the lanterns, families hosting the cabins, groomers making the trails great… We didn’t mention them all here. Please give yourself a pat on the back.